Bottom end: 4age 16v (red top) as a base engine. 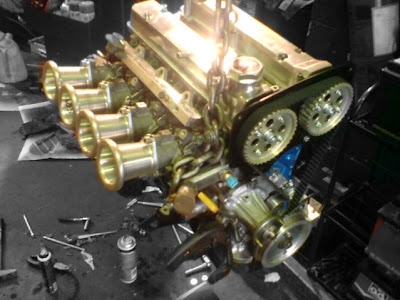 Toda valve springs, cam gears and .8 high comp head gasket..
techno-toy-tuning intake manifold and velocity stacks. its running on an omex 600 standalone ecu which I wired up to it, more spec will be added to this engine soon as well as further mapping so expect more updates on its progress soon!!!!!!!!! I had no problem with them running this power. the injectors are the green 12 ohm ones found in the ae92 small port.